A monument outside of the Ouellette campus at Windsor Regional Hospital had a sculpture removed from it. Windsor Regional Hospital has reported a partial theft of a 73-year-old memorial outside the Ouellette campus. 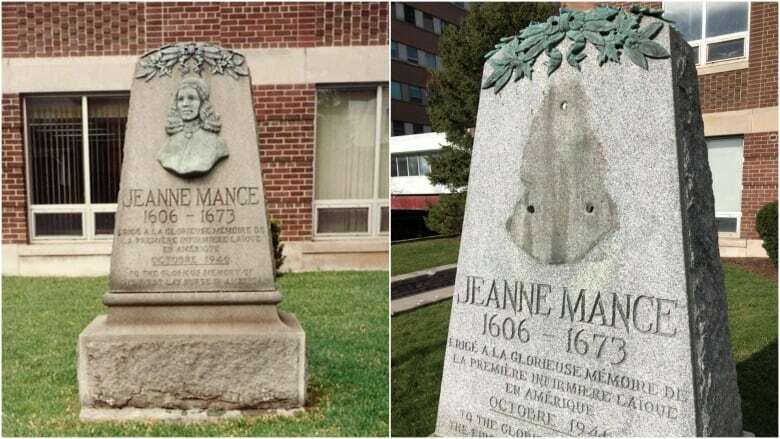 The monument honours Jeanne Mance, one of the founders of Montreal's first hospital Hôtel-Dieu de Montréal in 1645. "She's got a very historic role in terms of the history of canadian health care," said Steve Erwin, WRH's spokesperson. "It's sad to see those kinds of artifacts that have kind of been such a long-time part of that property removed like that." The sculpture part of the monument was taken off the monument. The hospital believes the bust to be made of copper and it may have been taken for its value. "It looks like someone had just pried it off of the stone that it was placed on," he said. It was reported missing to the hospital sometime last Thursday. Erwin said the hospital is also going around to industrial sites with photos of the monument so they are aware it was stolen if they come across it.